OK, my people, this is one of the most, if not THE most popular type of cookie I make. Well, perhaps not a “cookie” precisely. Those in the midwest might call it a “bar.” But I digress… Mint brownies have been part of my repertoire for at least 40 years, no joke. When I contracted for catering jobs we would make sheet pans full of these brownies and no matter how many I made, there were seldom mint brownies remaining. To this day, I keep a slab of these chocolaty treats in my freezer and when my children or special friends come to visit, I often find them rummaging through my freezer on the hunt for frozen chocolate mint brownies, regardless of the time of day. When in doubt for what to prepare for dessert, this is my go to bar cookie. The proliferation of designer bittersweet chocolate in the marketplace is a godsend to me, a rabid chocoholic. I do use ordinary Bakers chocolate for the brownie itself. But it’s nothing but the best for the ganache top layer – my favorite Scharffen Berger bittersweet chocolate. My original recipe made a smaller, 8 x 8 brownie pan-full. But really, as long as you are getting ingredients together and following all the steps, you might just as well go all in and make a 9 x 13 pan-full. It isn’t hard but it does require paying attention to timing: time to cool the brownies, time to harden the buttercream and time to set up the chocolate topping. In other words, it’s more than one step and a good project to do if you are home at night, watching a movie or reading a book with no time crunch. Just consider making these a zen experience. Go for the end result, the prize: a dense chocolate almost candy-like square with more chocolate and mint. It’s worth it. Preheat oven to 325 degrees with the rack in the center. Grease and flour a 9 x 13 cake pan on the bottom and sides. The brownie layer can be made without an electric mixer. In a small saucepan over low heat, melt chocolate and butter until the chocolate is just melted. Cool for 10 minutes off the heat, and add eggs, vanilla and sugar and beat well, then add the flour and salt and stir until combined. Pour into the prepared cake pan, even the surface with a knife or spatula and bake for 30 minutes until done. Then place the brownie pan on a rack to cool for at least an hour. Note: you can stop here and top with powdered sugar OR chocolate icing or with plain vanilla buttercream. With an electric mixer, cream the butter well, add the powdered sugar a cup at a time and finally add the milk, food coloring and peppermint extract. If it gets too thick while adding the powdered sugar, add some of the milk halfway. Spread this mixture evenly on top of the cooled brownies and chill in the refrigerator for 30 minutes. After 30 minutes is up, remove from the fridge and let the pan of brownies topped with buttercream sit on top of the counter for 5 minutes while you melt the chocolate for the next layer. Melt chocolate with butter over low heat, stirring often. I take it off the heat when the chocolate is nearly all melted, and it continues to melt off the heat. Cool for 5 minutes off the stovetop before spreading or you will melt the green mint layer! Pour this chocolate mixture on top of the green buttercream layer and tilt the pan to cover all the green frosting. (Lick the chocolate remaining in the melting pan!). The chocolate will look “shiny”. Refrigerate the three layer brownie for 20 minutes then remove from the refrigerator. I score them right away , dragging the knife through the chocolate layer. I remove ¼ of the brownies from the pan and cut them into 1-inch square pieces – any bigger is too much even for me! Continue cutting the brownies into squares and wipe the knife with a warm clean cloth between cuts. I then place the individual brownies to a tupperware container, putting waxed paper between layers. These keep in the refrigerator, covered, for five days and freeze really well for up to three months. Eat them cold or frozen! This entry was posted in Cookies, Dessert and tagged mint brownies. Bookmark the permalink. 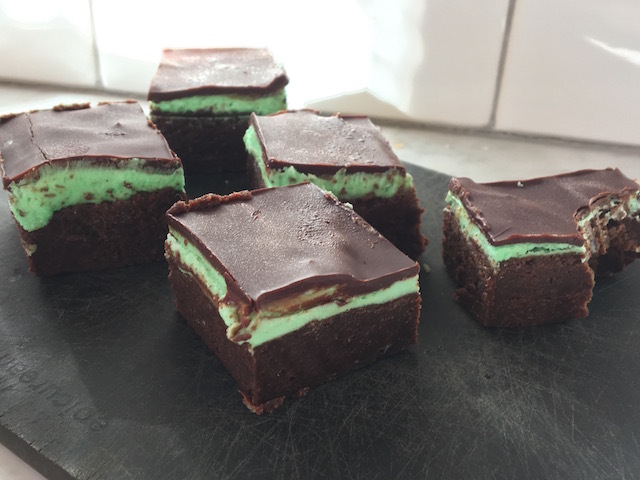 Yum looking forward to trying these…My Sons love chocolate mint anything…..Thanks for sharing…. If they love chocolate and mint, they will love these!